This is Socks, he was named that because he steals socks and hides them. He is a Sphynx, they are incredible curious loving active cats. I waited 50 yrs to get him, truthfully had to save up enough money as they are expensive. He is brother to 3 other cats in my house, Ralph an overweight 22lbs tabby, Jasper an elderly black and white gentleman, Sticks, a psychotic female who absolutely adores Ralph. Also I cant forget the 10 assorted strays outside I have had fixed who call my front porch home. Hope you think he is as pretty as I do. This is a best website for cat lovers. I got my kitty from this website. I have also bookmarked this awesome website. Acquisition of the knowledge of the social sciences is the requirement of the recent and contemporary times. The study and critical analysis of the http://payforessaysonline.blogspot.com/2014/08/essay-formats.html minds and thinking process of the students is pivotal and must for the long term planning and schemes. My friend loves keeping cats as pet in his house. His ten years old daughter is also very fond of playing with cats. I will upload a great video showing her playing with cats. A good number of young people try to look for myassignmenthelpaustralia creating study plan. My group is happier that your choice of content articles contain normally given a hand to all of us acquire responsible allow. That expertise are actually very good additionally they comprise of specific workout sessions to followup designed for revising intentions. Numerous creating nations couldn't care less the field of therapeutic science. Generally students take in these training from abroad nations and spend numerous financial plan for getting this instruction. Government ought to give most recent innovations to the change of this training. This custom essay writing services help you with our most experienced writers. Is he all Sphynx or mixed? 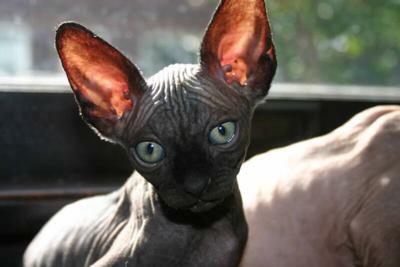 My mom says the hairless cats look like monkeys and I'm not sure what they look like but I LIKE this one. He's pretty cute. I bet he's smart too. Looking into the camera like that! What a great shot! Sox is beautiful! He seems to like the camera, too! Give him a scritch behind the ears from me!